I love making spoon sweets and every time I write about one I end up saying that it is my favourite. Each one has a different taste and when raw even if it is bitter like the walnuts or citrus or tasteless like water melon rind, when it is done it is transformed into something totally different and delicious. Making spoon sweet is not difficult and bear in mind that in almost in all cases you will need the same amount of sugar as the weight of the peeled and cored fruit. The amount of water needed is usually for 1 part of sugar – 1/2 part of water. On Tuesday when I went to the the Farmers’ Market I was looking for bergamot to make a spoon sweet but unfortunately you rarely see them around. I did, however, find firikia, which is a variety of oblong small apples with a lovely taste and aroma and which is mainly produced at Mount Pilio. All spoon sweets can be preserved for a long time, so long as the syrup is properly thickened. I still have some cherries, quince and watermelon from last summer and when I crave something sweet, I always have something at hand. I am sending this recipe over to Grace of A Southern Grace, who is hosting the event Cinnamon Celebration. The event calls for a teaspoon of cinnamon and I guess that two pieces of cinnamon sticks could be considered as 1 teaspoon. Start by preparing the syrup using the sugar, water, cinnamon sticks, fragrant geraniums and lemon peel. Bring to a boil, reduce heat and simmer for 15 minutes. Remove from heat and allow to cool. 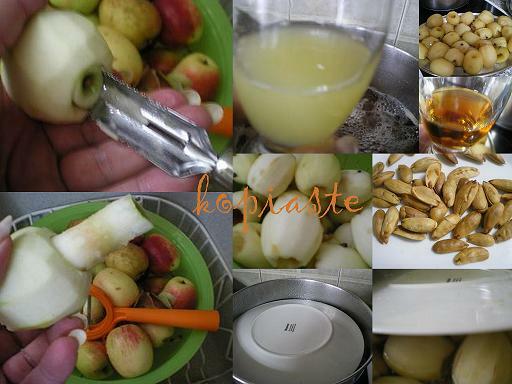 Meantime peel apples and remove the core and put them in a big bowl with the half cup of lemon juice. The lemon juice will prevent the apples to turn red. You will notice that the apple will float so place a plate on top of them to keep them submerged in the water. When the syrup has cooled drain the apples, put a clove anywhere and put them in the syrup. Again use the plate to keep them submerged. Bring to a boil, lower heat and cook until apples are soft (about 1 hour). Remove apples to a platter with a slotted spoon and when they cool place a roasted almond in the cavity. Check if the syrup has reached the right consistency and if it is too thin continue simmering. Five minutes before the syrup is ready, stir in the brandy and lemon juice as well as the apples and simmer for five more minutes. Remove from the heat and allow to cool before placing them in cleaned sterilized jars. 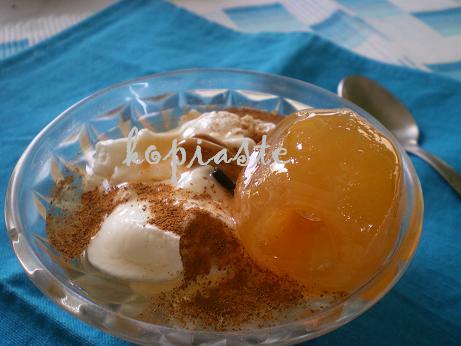 Can you think of anything better for breakfast or dessert: Greek strained yoghurt with apple spoon sweet, a few teaspoons of syrup and cinnamon!! This is heaven! I love spoon sweets…actually most kinds the Greeks make are delicious as far as I’m concerned! I’ve never had a mylo version before Ivy…looks amazing! I want to take a spoon and start eating that sweet…slur…..p very yummy one Ivy. I love the idea of spoon sweets Ivy. The translucency makes them look beautiful. And serving them with Greek yogurt…WOW!! These look delicious Ivy. I am once again intrigued by these “spoon sweets”. This post fascinated me. First, I never heard the expression “spoon sweet” and, secondly, the explanation and execution of the process. Looks absolutely delicious. I have never heard of a spoon sweet!! Whatever it is I want it!! Look very delicious!! Happy valentines day ivy! I see something new and interesting everytime I come here, Its great. These apple spoon sweets look delicious. This must have smelled delicious! I am huge on cinnamon too:) You have some absolutely delicious spoon sweets! Needed a clarification on recipe submission to blogger aid – does it have to be original in the sense that it should be created, or that it can be a traditional one but not taken from a book? Sunshinemom, regarding the recipes for the Cookboo, we want any kind of recipe so long as it is original in the sense that we do not have copyright issues later on, so a traditional one not copied from a book is certainly in order. I have never heard the term “spoon sweets” and I imagine it’s a Greek term? I have had “candied fruit” which is essentially what you have done with the syrup. I’ve made candied kumquats, for example. Is this the same I wonder? It certainly looks delicious! Cakebrain, yes the term spoon sweets is translated from the Greek meaning of this, as they were served in a big lovely bowl and a spoon with a glass of cold water was given to each guest to take some, eat and then drink the water. Ivy, can you believe it – I’ve never had spoon sweet before! I would LOVE to try this – maybe if I’m feeling adventurous one day I’ll make some, and in the meantime, I’ll drool over yours! Hi Sis. I wish I were in your area to try this particular spoon sweet. I remember in some restaurants in Greece being served a variety of spoon sweets once the meal was finished, or a plate of seasonal fruit….all of which were a kind gesture. Wow, I’ve never heard of “spoon sweets” before, but this looks delicious!!! And with some Greek yogurt and cinnamon and honey… Yum!!! Looks great Ivy!! Beautiful glyko, Ivy! The apple with the cinnamon and cloves would make this one of my favorite spoon sweets for sure! Lovely, Ivy! I’ll have to try making spoon sweet with apples, I never have. By the way, very helpful, concise summary of the basic spoon sweet recipe proportions. Ivy, this dessert looks wonderful. I love the combination of the apples, cinnamon and cloves. Looks delicious! And, with Greek yogurt, I bet they’re amazing. Ivy, you excel so well at “glyko koutaliou” and again, I encourage to try selling some of your spoon sweets. I not a big fan of them but I find yours tempting. I had no idea what a spoon food was. After seeing this, all I wanted to take a spoon and put a spoonful of this in my mouth. Loved it. This does indeed look amazing! Hard to resist, I’m sure!